Oh my gosh! Time really does fly so fast. I feel like it was only Mother's Day a few days ago and now Father's Day is fast approaching. I better think fast of what I should give my dad for this Father's Day. Who am I kidding? I already know the perfect gift for him and my only problem is to choose which one is perfect from the line of Casio watches. Yup! My dad and I are watch lovers! We share the interest in collecting different kinds of watches and we even share our watches. So it's like buying myself a watch too if you know what I mean. 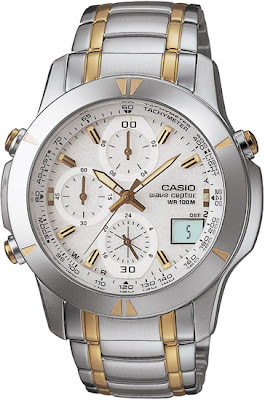 I really like this Casio watch over here. It's scratch proof and it has features like auto calendar and daylight-saving time on/off which is perfect for us because we don't want a repeat of what happened to us last time when we were late for work because we forgot to change the time. I just know that he, including myself, would love this watch. It's a perfect Father's Day gift indeed!